Best raised as transplants sown indoors 6 to 8 weeks prior to setting out after the last spring frost date, Hot Peppers love heat: afficionados theorize that the hotter the growing conditions, the hotter the Pepper. The heat in Peppers is related to the amount of capsaicin within the tissues and seeds. 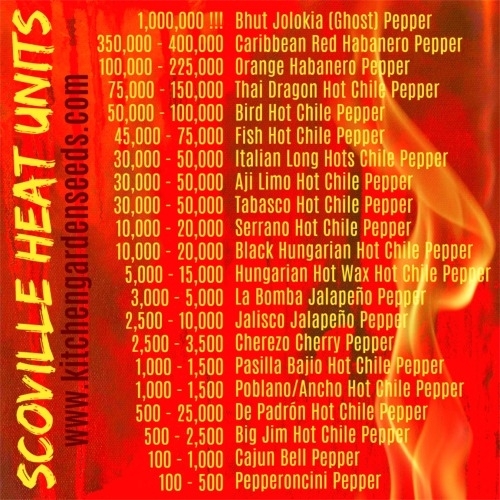 We include heat unit measurements (known as Scoville units) and arrange the Peppers in ascending incendiary order! At the height of harvest, hold a roast. Place picked Peppers on a hot grill, turning them until all sides are charred and blistered black. Pile them all in a paper bag so that they steam each other's skins off. Once they are cool enough to handle, peel off the skins, remove the stems and slice into long pieces, scraping away the seeds. Freeze in airtight plastic bags for use on sandwiches and in sauces, stews and casseroles through the winter. Deer resistant. Start Peppers 6 to 8 weeks before the last spring frost date in your area. Sow 3 to 5 seeds per individual pot of starter mix or singly in peat pots. Provide light, even moisture and ventilation. Bottom warmth hastens germination. Seedlings prefer 70° to 85°F during the day with slightly cooler temperatures at night. Individually transplant the strongest seedlings to 4" pots and fertilize weekly. Do not allow seedlings to become root-bound. Amend a well-draining, sunny site with organic fertilizer, compost and/or well-rotted manure. When night temperatures are reliably above 55°F, expose the Pepper plants to sun gradually over 1 week, then transplant. Water well and fertilize as needed with manure tea, kelp or fish emulsion. Mulch soil around Peppers if soil dries out too quickly. Harvest carefully, using a sharp blade, leaving 1⁄2" of stem, when Peppers reach desired size and color. From start to finish, Peppers are a crop that like it hot. Unless your climate is truly steamy, you must start them ahead in a warm spot, on a heat mat if possible, or on top of the refrigerator or kitchen cabinet. Only after warm weather has settled in should you set them out--in the sunniest part of the garden. For a greater overall Pepper yield, remove any blossoms that appear on your young transplants up until the time you set them in the ground. You'll miss out on the earliest fruits, but by letting the plant put its energy into its growth rather than early fruits, you'll get more productive plants later on. Peppers are among the easiest of vegetables to dry. Just select the best fruits with the deepest color (no trace of rot), remove seeds and slice into strips. You can use any type of food drier: electric, solar or even a box with a light bulb in it - try to keep the heat no higher than 120°F. You can even dry Peppers on a tray above a woodstove or a heat register. The Peppers are done when they are no longer sticky and can then be stored in jars or plastic bags. It is easy to reconstitute them in water to flavor and brighten winter fare, especially rice and pasta dishes. To make a delicious homemade paprika (either hot or sweet), dry the Peppers until they are crispy, then pulverize them in a blender. You'll be so amazed at the fresh, rich aroma of this home-grown spice that you may never use commercial Paprika again. And you can choose the degree of heat!